Local universities time and again have shown their enthusiasm for stepping into the realm of policing attire. Will Pakistani universities ever draw the line on moral policing through enforcing dress codes on female students? Don't hold your breath. In continuation of what appears to be an endless pursuit to produce morally upright and 'decent' students, local universities time and again have shown their enthusiasm for stepping into the realm of policing attire. Recent events demonstrate that this trend is thriving. 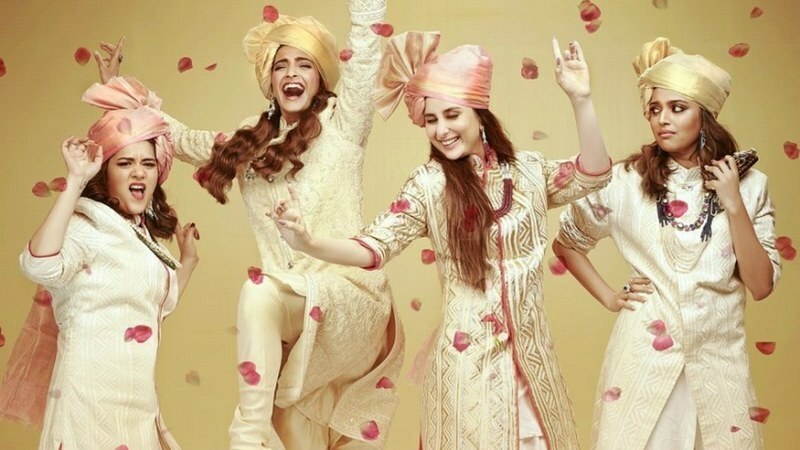 Earlier this week, University of Agriculture Faisalabad announced it will celebrate 'Sisters' Day' on February 14 by gifting scarves and abayahs to female students. A similar trend was witnessed last year when a faculty member at the Institute of Business Management (IoBM) shared her experience of being policed for her attire by a security official at the gates. The debate around the politics of problematic dress codes emerged a few years ago when female students at the National University of Science and Technology (Nust) were named and shamed for wearing jeans, tights and not wearing dupattas. Nust distanced itself from the incident when it came to light after a student who was targeted shared the notification on social media. Also last year, Punjab Higher Education Minister Syed Raza Ali Gilani proposed making hijab compulsory in colleges in the province. His proposals ─ which were disowned by the Punjab government ─ included the incentivisation of observing hijab by rewarding female students who had fallen behind in attendance or marks simply on the basis of their head covering. Again, the International Islamic University Islamabad said it had started enforcing a 'decent' dress code for its female students ─ in which wearing a dupatta or scarf is compulsory ─ in the management sciences department. A university rector explained that the need for the dress code for the department arose as it was in an isolated location from where women walked to other departments. "There are a significant number of male teachers in this facility," he had said by way of explanation. It wasn't always like this (scroll down for more on that). But alas, it is today. Here's a list of dress-codes adopted by popular universities across the country. The institute asks female students to wear "modest" clothes. It specifies that female students can only wear jeans with knee-length shirts and must "avoid transparent materials and short lengths for sleeves". 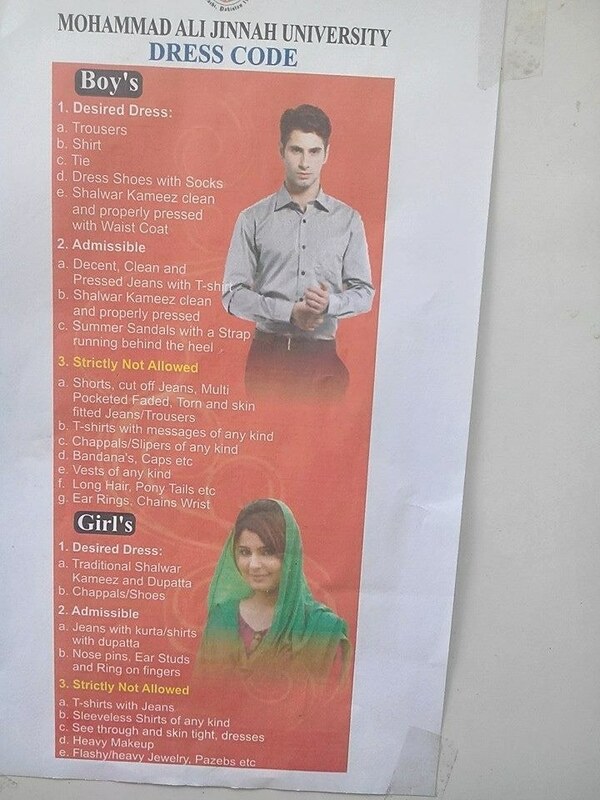 University identifies shalwar kameez as a staple for female students, but does not permit male students to wear the national dress ─ except on Fridays. 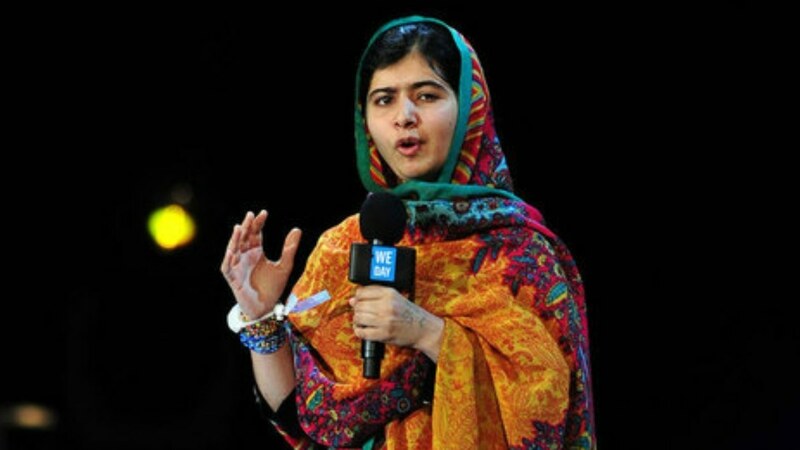 "A dupatta/scarf is compulsory with all dresses," the rules say. Again, for female students, the length of the shirt is specified ─ "jeans/trousers with long shirt/kurta (knee length)" are permissible. Tights are not allowed. "I cannot understand why we can't wear our national dress. Shalwar Kameez is part of our culture. Is Bahria not a part of Pakistan?" asks Umar, a student at the university. The university has divided its dress code into desirable, admissible and "strictly not allowed" articles of clothing. For females, shalwar kameez are the desirable outfit, while jeans with kurtas and shirts are admissible ─ with a dupatta. However, jeans with t-shirts, sleeveless shirts of any kind, see-through and skin-tight clothes are strictly not allowed. Males at MAJU have a wider range of desirable clothing options to choose from ─ trousers with shirts and shalwar kameez. Wearing jeans and t-shirts fall into the admissible category for male students. Interestingly, skin-fitted jeans and trousers, long hair, wrist chains and earrings are strictly not allowed. Surprisingly, the university has a heavily-regimented dress code for males in comparison to female students. Nust's dress code, which applies to both staff and students, appears to be an anomaly ─ the same codes apply to both male and female students. However, this university's dress code reveals another issue prevalent with dress codes ─ that of vague and undefined terms to enforce rules. The rules are in place "to maintain academic dignity and sanctity of the institution", it says. "Students and staff of the university are required to wear decent dress keeping in view local cultural values... The purpose of the dress code... is to maintain good morale, respect, cultural values." It also goes onto say that "gaudy or immodest dress" is not permitted in classrooms, the cafeteria and university offices. However, terms such as 'dignity', 'decent', 'cultural values' (mentioned twice), 'good morale' and 'respect' are highly subjective and ambiguous. What is decent for one may not be decent for another. So who decides what is 'decent'? The university asks its female students to wear "culturally suitable outfits", raising the question of why male students are encouraged ─ even ordered to wear ─ western clothes instead of "culturally suitable" outfits (given the socio-cultural connotations behind the phrase). Here, an undertaking is signed between female students and the administration that binds the former to wear headscarves. Although the rule is enforced sporadically, it is there for any teacher to implement. "We signed an undertaking that we shall wear scarf and lab coats inside the premises. We were also provided the headscarf and coat for free. But only our computer teacher forces us to wear both those items in our lab classes. It is never strictly imposed though, unless you are studying medicine," she revealed. 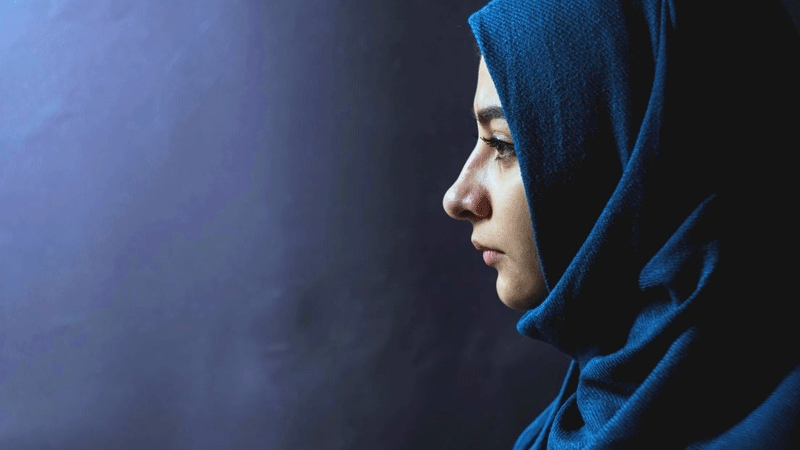 A male ex-student from Isra University, Rafay*, looks beyond the moral undertones of the university's arbitrary headscarf policy and feels that the administration should not have policies that it doesn't seek to enforce. "The university has made these codes but they don't enforce them. There is no point in having these codes because they are only enforced selectively by teachers who are motivated on their own to enforce what they feel looks 'decent' on students." Why implement these dress codes? An environment conducive to the development of free and independent thought is one of the cornerstones of a meaningful university experience. But in an attempt to regulate and moderate the physical appearance of its students, universities are undermining their own role as incubators for free thinking, progressive minds. When students graduate from schools to universities, they are met with a number of changes. For one, there is no uniform. However, they must enter "the professional world" ─ an office environment in which workers are expected to dress a certain way. This is the framework within which most universities try to rationalise their policing of attire. Bahria University Spokesperson Mahwish Karman says the idea behind the institution's dress code policy is to instill discipline among students, uphold the decorum of the institution and to follow societal and cultural norms of the Islamic Republic of Pakistan. "Shalwar Kameez is restricted to Fridays because we have students coming from parts of KP and Sindh and they must be taught the proper attire for a business environment which does not include Shalwar Kameez," she states, adding: "Similarly, for women Shalwar Kameez with dupatta is the appropriate attire." NUST, in its dress code policy, states that the purpose of the dress code "is to provide basic guidelines for appropriate work dress that promotes a positive image of NUST, besides allowing flexibility to maintain good morale, respect, cultural values and due consideration for safety while working at laboratories." Amidst the ambiguity, Amna Zaman, a student at NUST's social sciences school points out that the idea to regulate what students wear is not as destructive as it is often made out to be. "In our freshman year, we were asked to not wear jeans and I spoke to the Dean about it. He said 'when you get into the business world, you can't go to an office wearing jeans and a shirt'. 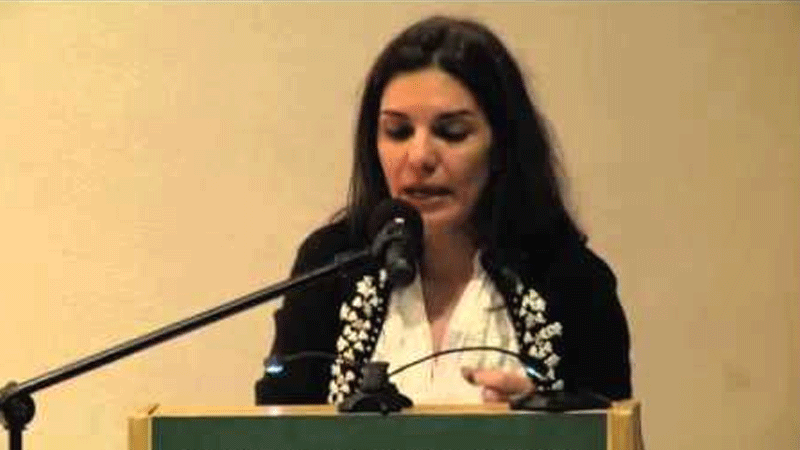 The discrimination wasn't just against girls, it was against guys as well," Zaman says. "It is not a very big issue for us, especially at the social sciences school. The rules are put in place to make sure no body dresses too shabbily," she explains. "Personally I feel that they've tried to teach us to dress in a manner that is in line with the industry; you need to look presentable, you need to look more formal, whether you're in eastern clothes or western clothes. I think that's necessary. If I had my own university, I would enforce that too. Universities are not just about teaching people what's written in the books. It's also about training you for the real world." 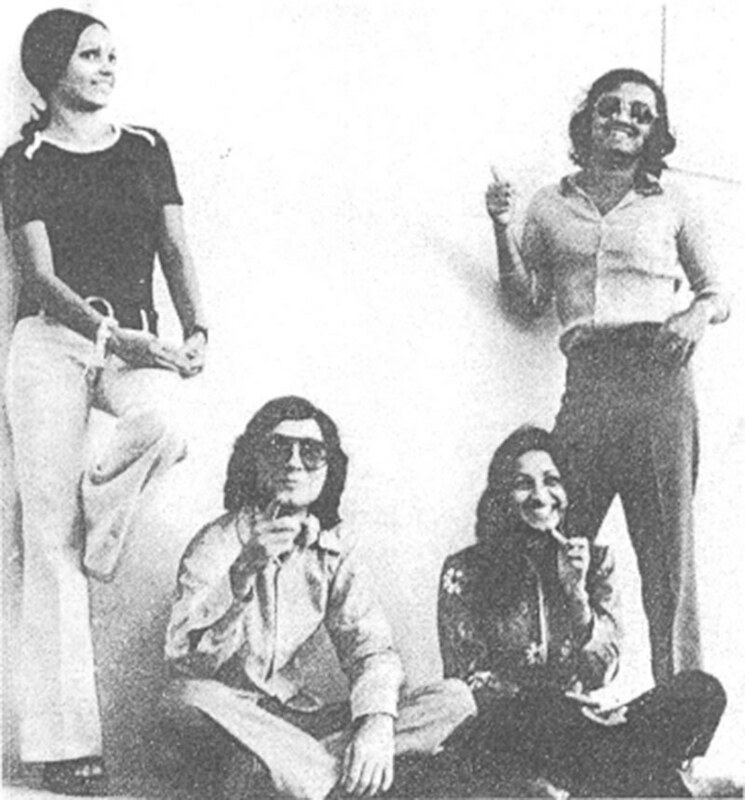 A group of students at a Pakistani university in 1975. — Dawn. Nazli, who attended the Department of International Relations at KU in the late 60s, recalls there being no formal dress code in place. "There was no dress code, but people would wear black cotton gowns similar to those worn by university graduates as part of a uniform. Everyone wore them. It was understood they would wear them." "I don't remember a lot of girls wearing hijab. Sometimes girls would cover their heads with dupattas outdoors to protect themselves from the sun. Maybe about 10-20 per cent of the female students would wear hijab," she says ─ a proportion that has grown exponentially since then, according to students who have attended KU in recent years. "I mostly remember wearing shalwar kameez, but I think bell bottoms were in fashion then," Nazli adds. When it came to ensuring students were dressed 'appropriately', a proctor was responsible for taking disciplinary action against boys and girls who were not 'decently' dressed, she explains. "Back when I was at the Punjab University (PU), there was no concept of a 'dress code'," reveals Shahida Sipra, a philosophy student at PU who graduated in 1977. "We would sometimes ride our bicycles from Lahore's main market to our campus wearing jeans and a top; nobody would object. Even on campus, there was practically no fear when it came to interacting with boys or wearing whatever you were wearing," remembers Sipra, who is now a teacher. Sipra's memories of her time at university are reminiscent of an era when Islam was not as politicised as it seems to have now become ─ especially on campuses. "It all went downhill as Zia-ul-Haq came to power. The Jamiat propped up in Punjab University, bringing with it, a wave of conservatism and fear." "Girls would often get rid of their headscarves after moving to Lahore from smaller cities. For us, it was a way of identifying girls who were new to the city," Sipra says. Director of the Centre of Excellence in Gender Studies at Islamabad's Quaid-i-Azam University, Farzana Bari has been affiliated with the university since the early eighties when she was a student here. The culture of the university, she says, has changed a lot over the years, becoming more and more conservative. "Then there was free mixing between students, and girls and boys treated one another as friends. Now most women cover their heads and many choose to hang around in women only groups," she said. Why is Pakistan afraid of happy women? Please also add islamic international medical college to your list, that is the epitome of misogyny. They also ‘provide’ scarfs to their female students and if they dont oblige they are slammed with a ‘supply’ (flunk). And professors there consider themselves self righteous indivisuals who think its their ‘right’ to preach. In my house job interview i was oggled by the Dean of college from head to toe and advised to keep my dupatta on my head if i want to complete my house job. Its a sexist college yet no one openly talks about it. Every place has a dress code. Back in university I was allowed to wear trouser and t-shirt but not in my office they do have a dress code. In colleges prior to university you are not allowed to wear t-shirts. Why make fuss of everything. In FAST Lahore there is a different dress code for Business graduates as well as Engineering. Financial punish is best policy for mistake improvement. Great NUST...!!! The pic from 1975 looks like the students were 45 years old. Dress codes are there for the purpose of discipline and a decent outlook. It is implemented in most of the well-known Universities of the world. It is not meant to create issues like it is done by Jamiat in some of the Universities. As far as I know, modest dressing is required by students of both genders. The best way to deal with these mindless actions and implementation of the fine is to make a uniform for your university that will make lives of parents as well as the students easy. I believe universities are power-house of intellect and it should not be curbed by any means whether its a dress code or any kind of limitations that defines limits and boundaries on the thought process of students. I also agree that cultural norms should be adhered but instead of defining limits, the universities should provide the environment to students to do what they are supposed to do without boundaries instead of wasting time on things they are not supposed to do in a university. Universities should direct the energies of the student minds to right direction instead of suppressing them. Suppressing the thoughts of university students is by its nature contradicts with the idea of a university and research. As Einstein put it beautifully, "The principal art of the teacher is to awaken the joy in creation and knowledge". Uniform works at Elementary and High School level, but at College and University level I believe it is an overkill. Parenting and Schooling is a long term process if we are not able to raise our children with morals before they enter College than it merely means we have not done our job. A 16 to 18 years old boy or girl should know the difference between modesty and vulgarity. If they choose to wear a dress that is not appropriate for their age when they enter college, it simply means that parents have done not a good job raising them. A student should have freedom to pick an age-appropriate dress based on the culture and value of the nation. What rubbish. They have lost the point and purpose of University. If they can't tolerate the freedom and liberty to exercise how you dress, how would they ever tolerate any freedom to think and speak. Shambles in the name of morality. Not a good development. Let people wear what they desire. It's a private matter! Even living here in the west, grown up here and have done my entire study here I was being told by a total stranger man with a long beard that I should wear a "pardah". I don't understand why they bother about what others are doing or wearing! What an ignorance! Moral policing is against the human rights and its unacceptable. I desperately failed to understand why our morality is only linked with dress code of female folks can anybody make me understand that by covering over females folks with long piece of cloth can make our society civilized can eradicate corruption can eradicate nepotism can eradicate terrorism can make our people a law abiding, educated, civilized nation ? Everything done in moderation is good. Be fashionable but don’t forget where you’re standing and your cultural roots. Be a good example to the younger generation as you might not be aware but many of them look upto you for inspiration! @maverick I don't think the objection is with the dress code; but with the unequal definition of acceptable wear for male and female students. Perhaps these Universities should focus on educating their students rather than moral policing which is none of heir business. Good to be studying in India. It's blessing no one is moral policing us. When our education facilities are going to produce young men and women who can make their own judgements and act like grown ups? A university graduate must have learned qualities to lead and maturities for our developing Pakistan. Why we still are controlling their minds? What else do U expect from this Administration and this Country? No surprises here. This could easily lead to rights being eroded. With all the sexist behaviour and abuse of women so rampant in the society, this is the last thing any institution of higher learning should be doing. A university should embrace openness, diversity, and should make every effort to facilitate interaction between the sexes, and should operate on the principle of equality. Instilling the notion that women are to be good little girls who must obey and conform is certainly no way to facilitate the transition into adulthood, as it is detrimental to personal growth and development. It is not dress codes that need to be eforced, it is the perverted minds of some men that are really the cause of the problem. This is the real issue that needs to be addressed. Pakistani Universities as mentioned above are treating their students more like school children. 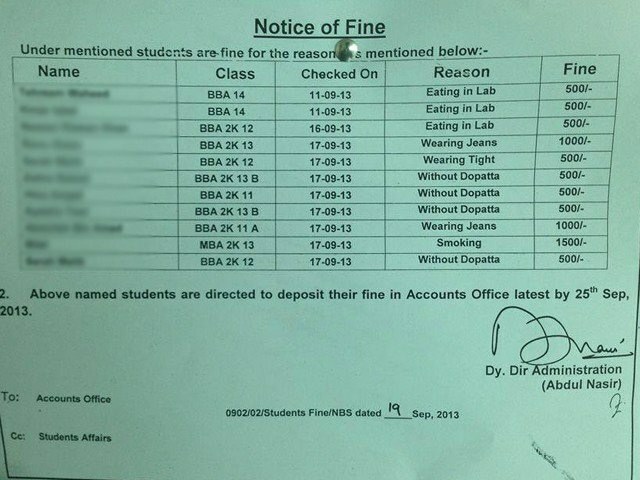 Never heard where students are being fined for what they wear while attending universities. Also their is this constant chant about Pakistani values and our culture, but culture do change for the betterment of the society, some of our clothing is out dated and should be refashioned. Keep fundamentalists at bay. Better yet relocate them in villages. Or follow Turkish example. Trust me we will be better off a thousand times. No one is practicing the religion as is, Mullah is corrupt, bearded ones are clueless and Niqaabposh are, well, watch youtube and look around. So please spare us all.
" A student should have freedom to pick an age-appropriate dress based on the culture and value of the nation." why appropriateness of my dress should be decided by culture and nation? everyone should free to choose what suits to him , if not harming others. How scarf, hajib help women in office environment, why so called national dress not proper dress for work places? I hope universities will eventually focus on innovations, researches and quality education. There is no need to worry about dress code.